Three months ago, I announced that ILFA was on the way out. At the time, I envisioned a rather grand sendoff: a comprehensive series of retrospective posts and lists, some final hard-hitting editorials, interviews and Q&As with friends and foes from blogging days past, and maybe even a big night out to send it all off. This never really happened, largely on account of the same factors that encouraged me to shut down the blog in the first place (I had neither the time nor the wherewithal to get these things together and the conversation about Franklin Avenue has changed in a variety of ways that render little ol' ILFA something of an afterthought). I managed only a final ILFA roundup, covered a couple of new openings, and pulled together a year-in-review post before collapsing into a heap. In spite of my own ineptitude, readers and friends have helped me out as I put ILFA to bed over the past several weeks, often with kind words that left me feeling very lucky to have shared in their company. Among these were a far-too-kind sendoff from Zachary Goelman of Epichorus; a comparative piece on neighborhood change in DC from one of my oldest friends, Columbia Heightser Colin Richardson; a wide-ranging interview session over a few beers with whynot/MikeF of Brooklynian; a sweet exit interview of my own with Sonja Sharp of DNAInfo (and some very kind quotes therein from Penina Roth of the Franklin Park Reading Series and Atim Oton of CB8 and Calabar Imports); and last but not least, any number of heartwarming comments from readers (even some of the spam comments on that thread were heartwarming, but maybe I'm just getting nostalgic). As I explained back in October, I've lost my edge, both on account of my own commitments (trying to write a dissertation, primarily) and the rise of a host of sites and reporters covering Crown Heights far more comprehensively that I could ever manage. The conversation has also changed in a number of ways, some of which leave me without much more to say (yes, indeed, Franklin's changing) and some of which have left me without people to talk to. Time was when I got pushback from the left and right when I posted about changes, but these days, the folks who demanded a more rigorous and thoroughgoing critique have almost all moved on, leaving only the hooray-for-new crew. There were always going to be loose ends, threads left hanging, as I wound down, and given how idiosyncratic the blog was, as a project, having some kind of big comprehensive sendoff wouldn't really be consistent with the past five years' worth of postings. 1. 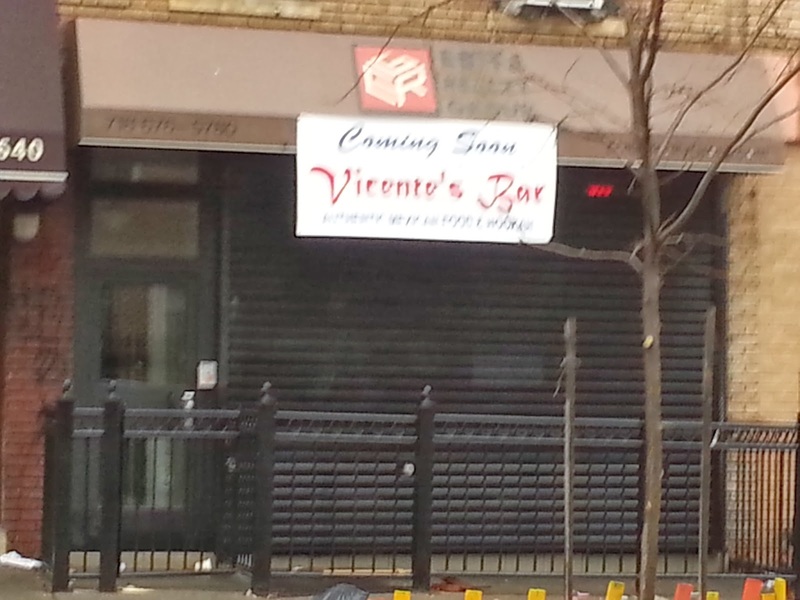 New businesses like Vicente's Bar: Authentic Mexican Food and Hookah (see above). These posts were always fun; as I noted back in October, walking into a new place and asking excited new folks what they were building is a great time. Plus, readers always have opinions they want to share. 2. The Fifth Anniversary of the Franklin Park Reading Series, a local event that's blossomed into one of the best regular readings in the city while retaining its commitment to promoting local writers and the diverse voices of Crown Heights. 3. The opening of 1000 Dean Street and the attendant transformation of what was once a small manufacturing area at the very northwest corner of Crown Heights (and an area that's been a topic of discussion in our local blogosphere for awhile). 5. The next round of rent-and-realtor-related protests and organizing (coming, one imagines, in summer 2014 if not before). The squeeze is getting tighter, and not everyone is going to go quietly. It'll be very interesting to see what happens, and what kinds of opportunities, if any, the supposedly-more-progressive city administration offers to advocates and tenants alike. 1. The folks at Nostrand Park, including Ferentz, Laurel, and Abeni, whose coverage of the neighborhood and thoughtful examinations of the changes coming to it were always an inspiration, and who encouraged me to take my own efforts seriously as politics and craft (without, hopefully, taking myself too seriously). 2. "Montrose Morris" of Brownstoner, who offered kind words to a new blogger and whose fantastic writings on local history and architecture offered a model for exploring the neighborhood on its own terms. 3. Brooklyn Born, whose unvarnished look at CH from the perspective of a born-and-bred Brooklynite pushed this newcomer to rethink assumptions I often didn't even know I held. 4. Zachary Goelman at Epichorus, whose coverage on crime and policing in CH and elsewhere is some of the very smartest around, and who moonlights as a fantastic movie reviewer. 5. The Brooklynians, particularly whynot_31/MikeF, who are never short on opinions, have a heckuva lot of knowledge among them, and are thoroughly relentless in their pursuit of CH-related info. 6. Sonja Sharp of DNAInfo, whose coverage of CH is never ordinary or boring, and whose attention to the entire neighborhood and all of the people who live here (and not just the wealthy at its western edge) is a welcome departure from much of the mainstream reportage. Century, for those who don't know, is the author of Street Kingdom: Five Years Inside the Franklin Avenue Posse, which documented life along Franklin Avenue in the mid-1990s (you can read the first chapter here). I gobbled this book up after it was recommended to me by Kevin Phillip (who opened his first spot on Franklin at the end of the period documented by the book), and I had the privilege of sitting down for a long and fascinating chat with its author in November. In lieu of the 2,500 post I'd likely have written a year ago, here are five quick takeaways from that chat (like the story of the Steuers below, this conversation will hopefully generate a longer piece of writing sometime in 2014). 1. Black Moon's Enta Da Stage (1993) is a truly fantastic album (as a friend, hip-hop fan, and lifelong NYer put it, "the whole thing is like a jazzier 36 Chambers). 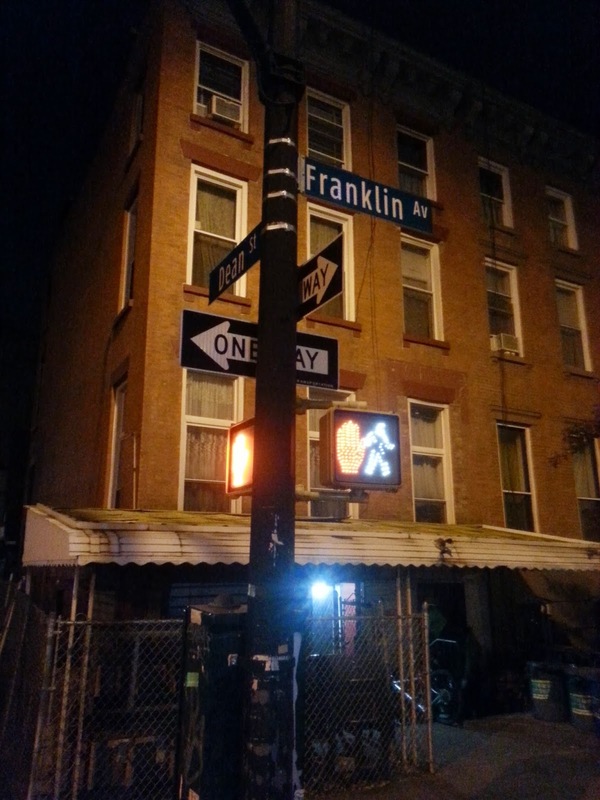 It's also riddled with references to Franklin Avenue, where the group was raised. Give it a listen while you read Street Kingdom. 2. Back when Crown Heights was "Crime Heights," the area's crews, among them the Franklin Avenue Posse (FAP) of the book's title, were as notorious for robbery as for crack dealing (which retains a larger-than-life place in the popular histories of NYC). Mike Tyson, no slouch himself when it comes to hand-to-hand combat, expressed fear in his youth of the ferocious chain-snatching and sneaker-stealing (as in right off your feet) that these groups practiced. 3. Despite its notoriety, Crown Heights never felt desolate or unwelcoming, at least to Century. Even in the years that immediately followed the riot, after decades of "urban crisis" and state-sanctioned abandonment of inner cites, Crown Heights retained a "fluid" character, with people from all over the world - Panamanians, Jamaicans, Southerners, Lubuvitchers - mixing along the Avenue, on the Parkway, and in the Franklin Avenue subway station. Brownsville and East New York, where some of his friends and the subjects of the book lived, felt isolated and menacing in these years (some parts still do), but Crown Heights had a cosmopolitanism to go with its criminal record. 4. Newcomers to a neighborhood like Crown Heights, at least in the early stages of gentrification, will often express surprise that every block seems to contain the exact same stores: a bodega, a hair salon, a little boutique selling incense and pirated DVDs (and maybe weed by the pound, if you can speak a credible patois), etc. In his time with the FAP, Century came to understand these hyper-local economies as dual products of criminal territoriality and the enclave nature of immigrant communities. In a world where corners are prime real estate - sites for doing business on the grey and black markets, hanging out with friends and family, seeing and being seen - and people retain alliances not just to home countries but home regions, islands, and villages, each block becomes its own little world, with its own crews and businesses servicing its basic needs. Jumping forward to my five years on the Avenue, gentrification isn't just a process of turnover or displacement, but also a re-scaling of neighborhood geographies of commerce, labor, and community. 5. Reflecting on his years on Franklin, Century acknowledged that some people, then and now, assumed that the experience must either have been very difficult or very calculated (in the manner of old-school structuralist anthropological fieldwork, perhaps). Century's time on Franklin was neither: he didn't plan to write the book when he first started hanging out on Franklin, and the subjects of his book became his friends. He did note, however, the importance of being aware of his privileged position, and of reciprocating their guidance with the assistance that he could offer to them as writer with an elite education. In talking about this, he said something that stuck with me, good advice for anyone trying to get to know a community as a newcomer, whether or not they plan to write about it (and I didn't plan to write about the neighborhood, either, when I moved to Crown Heights): "Be true to the innocence of your curiosity." 1. This MLK Day post from 2011 about a small Quaker library that was preserved when Dr. King's name was found on a check-out card was one of ILFA's most-read posts of all time. Why? It got re-linked on a message board in Oxfordshire in the UK, where a heated debate about the closure of libraries under David Cameron's austerity budgeting was taking place (and where ILFA was a student for two years). A post by a Brooklyn blogger retelling a story from Philadelphia about MLK reappearing in a debate about libraries in England where said blogger once lived? Why not. And while we're at it, it's always a good idea to preserve libraries. 2. Can you guess which ILFA post garnered the most non-spambot comments of all time? That's right, this fifty-three word blurb about Mayfield opening. Fifty comments followed, loosely centered around the restaurant's name (and questions of paying homage/cultural appropriation) but quickly spiraling into a massive debate about gentrification. I must have written 300 posts that dealt with neighborhood change more directly, but for whatever reason, this one brought the house down. The owners, who took to the comment thread to explain their decision, were as surprised as I was (and remain far more sensitive to the dynamics of the neighborhood's changing fabric than several of their "defenders," who trotted out bad analogies and sneering "I'm richer than you and can do what I want" arguments). The postscript? Mayfield's daughter got in touch with the owners much later on to say that she was fond of the name. 3. This post about MySpaceNYC issuing a cease-and-desist to the Crown Heights Assembly earned me a veiled threat of legal action when a commenter posted a phone number for one of their owners. They called to insist I take it down, but I never edited comments, and didn't in this case (out of a combination of laziness and not wanting to be a censor, as I explained, somewhat appropriately, in a comment a few years back). Three thoughts on this one: 1) Despite their less-than-sterling reputation, ILFA was willing to post flattering things about local realtors like MySpace as well as critiques, in the interest of offering a range of coverage and not imposing my politics on every single post, but 2) a surefire way to piss off any writer and ensure their critical attention is to try to intimidate them or their readers when they write about you and 3) if you don't want your number publicly available, don't list it with a business named after you on the internet. 4. The pawn shop protests of 2010 generated ferocious debate up and down Franklin Avenue and completely engulfed ILFA for nearly a month. In several posts, from the initial announcement of the pawn shop's arrival to an interview with the owner and coverage of the protest that was held outside of the shop (attracting several elected officials), I tried to document the impact of pawn shops on neighborhoods and the various issues at stake in Crown Heights. Readers, including business owners, community leaders, and a few folks employed at the pawn shop itself, argued heatedly about the shop, the protests, and the ways the debate highlighted inequalities of class and race in the neighborhood. A post I never wrote, but which could have been interesting, might have compared these events and with the similarly explosive bike corral fight of 2012. The takeaways, both expected and unexpected? In terms of lasting impressions, the protest looms large as an example of why ILFA voted for Letitia James for public advocate. While nearly every other elected official showed up, spoke, and left, Tish stuck around to talk to people and, more importantly, to LISTEN to people, including those at the impromptu counter-protest. She also went beyond the easy talking points (pawn shops attract crime and drive away other businesses, etc) to emphasize the need for better access to credit and jobs for those residents who weren't being served by gentrification. The protest also caught the attention of other communities fighting pawn shops, including groups in Sunnyside, Queens, and North Merrick, Long Island. The latter contacted ILFA for advice, but I didn't have much to offer. Despite the many efforts of community groups and electeds, the shop opened (after changing its name to "Crow Hill Jewelry"), and when it closed, it seemed largely to because the changing demographics of the neighborhood meant the disappearance of the potential clientele. Pawn shops continue to exploit people in ungentrified areas of Crown Heights. There's not much of an uplifting lesson there. 5. In 2010, the lady's father gave me a tie that had belonged to his father-in-law, and which had been purchased at the store of "Sam Steuer, Haberdasher" in Bay Ridge. A little research didn't turn up too much information, but I still wrote up a post, hypothesizing that my grandfather-in-law had purchased the tie en route between Minnesota and Germany, where he served during and after the Second World War. Three years later, I received an email from Howard Steuer, Sam's grandson, whose father Arnold (Sam's son) is still alive and well out on Long Island. On Labor Day, I spent a thoroughly enjoyable hour on a conference call with the whole Steuer family, learning from Arnold, his wife Iris, and Howard about four generations of family history. The patriarch, William (Sam's father, Arnold's grandfather), came to Brooklyn from the Old World just before the turn of the last century and got started in the clothing business as a discount retailer, later opening an Army and Navy store in Williamsburg during the depression. Sam, born in 1908, started in business with his father but eventually struck out on his own after he got married. In a delicious twist for this blogger, Sam and his wife lived briefly in Crown Heights, and Arnold was born at our very own Jewish hospital. The family moved to Bay Ridge to open Sam's haberdashery in 1950, when Arnold was 13. The younger Steuer began working in the store after school and on weekends, and could very well have been the clerk who sold my grandfather-in-law his tie. Arnold recognized the "unusual design" immediately, placing it to somewhere between 1950-1955. Like his father, Arnold stayed in business with Sam until he got married, and then he, too struck out on his own, finding success as a representative and salesman for a host of national wholesale clothing chains. Howard, who sent me the email after his mother discovered my blog post, worked for nearly two decades in the same business, marking nearly a century and four generations of family success in clothing sales for the Steuers. These kinds of stories and connections were always the best part of blogging. While I'm done with ILFA, I'm not done with this particular one. Look for a longer piece of writing about the Steuers under my byline somewhere in 2014. At the Town Hall Meeting back in March, I helped facilitate one of twelve small group discussions. The group was diverse (though, like the Town Hall itself, skewed somewhat toward newcomers), and the conversation was frank, honest, and, at times, raw and contentious, but the process ultimately felt productive, and I think most of the participants left the discussion feeling that they'd had a chance to speak their piece and be heard. Brooklyn Born was a part of our group, and he wrote a wide-ranging and thoughtful reflection on the experience on his blog. 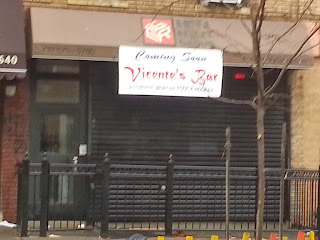 One of our participants (who also happens to be a neighbor of ILFA's) expressed concern that a divide was growing along Franklin Avenue as new businesses opened catering to very specific clientele and new residents arrived who shunned older businesses purely on account of the look of their facades or, worse, the color of those behind the counter. The lady and I have discussed this change, too; when we arrived, in 2008, shopping only at hip, new spots or spending time in bars and restaurants populated only by those in our age/educational/racial bracket was out of the question, as such places didn't exist yet. If you lived on Franklin in 2008, you got to know a diverse range of people almost by default (or, put another way, you had to work hard to live in a bubble). Fast-forward five years, and that's changed a lot, both for new arrivals (who might never really encounter anything other than hip, new Crown Heights purely by following the path of least resistance) and longtime locals (many of whom have expressed privately that they often feel very uncomfortable and unwelcome in some of the newer places along Franklin when they do try to patronize them). 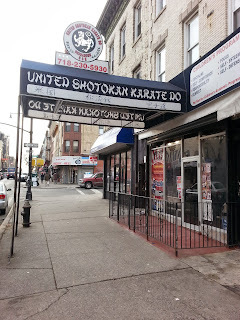 My neighbor and fellow town hall attendee gave one example of a place that she loved but felt was unknown to newcomers, Debranche United Shotokan Karate Do. Her two children, she noted, were having a fantastic experience training and learning at Professor Denis Debranche Sr.'s center on Franklin just north of St. Johns, and she hoped that more of the new parents in the neighborhood would explore it. When she found out that I wrote this blog, she encouraged me to post about it. Alas, my disintegrating blogging abilities kept me from doing this, but I can keep a promise in the waning hours of 2013 by putting this here now. Really, my conversation with her should have evolved into three posts, in the three different styles that ILFA most often utilized: an exploration, an editorial, and an exhortation. 1. The exploration - like so many that began when I walked into a business and struck up a conversation with the owner - would have talked about how Prof. Debranche has been on Franklin for nearly a decade. It would have talked about how his youth classes include scheduled time for doing homework, and how students advance based on both physical prowess and academic performance (parents are asked to share report cards with the instructors). It would also mention that the center offers a series of classes for adults on weekends and in the evenings, and will be introducing yoga and zumba on Tuesdays, Thursdays, and Fridays in 2014. It would have ended like this: check it out! 2. The editorial would have been even longer than this digression and would have contained reflections from residents, business owners, and others I've talked to who've worried about the polarization of residents and commercial establishments along the Avenue. It would have drawn, probably too much, on scholarly studies of these phenomena, and would have tried to present multiple perspectives and contextual factors. 3. The exhortation, like posts I wrote after walking into the middle of something, would have picked up on an overheard comment at a bar or on the street, one that betrayed the biases of newcomers. While I hope that ILFA has been interesting to a wide variety of potential readers, I think I've been honest about who I am - young, white, privileged, and recently-arrived (though by the standards of the day, not so much anymore) - and, on occasion, I've tried to speak to others like myself about how our behaviors, privileges, and choices affect this changing neighborhood. Having heard far too many sidelong dismissals of longtime residents and their establishments as "ghetto" or worse, the exhortation would be a fairly simple one: challenge yourself and your friends to check these assumptions at the doors of the 4 train, and push yourselves to get to know some of the people and places that make Crown Heights unique and wonderful. 1. The Pinnacle Realty Group who put up this sign are not, in the end, the same folks who end up on the city's "worst landlords" list year after year. Whoops. 2. This trite little post about an MLK Day cleanup earned me some serious, and legitimate, criticism in the comment section. I issued a mea culpa at the time, but the conversation, even if I was the idiot, remains enlightening. 3. As it turns out, a whole lot of Brooklyn has telephone lines above ground. 4. Remember ProCro? I got my initial response to one of the biggest local sagas of 2011 wrong in several ways: I waited to post it, thinking that this wasn't really news (strike one); I suggested the reporter was a dupe for using the term, but the phrase, as closer reading showed (and as he pointed out to me when I met him), came from a landlord, not him (strike two); and I threw in an incorrectly-cited link to policing problems as a way to change the subject (strike three. siddown, ILFA). 5. Back in March of 2011, I received a very distraught email from an anonymous reader who had been assaulted late at night on Franklin. After some mulling, I posted it with my own garbled comments. In writing it out the way I did, I was trying to emphasize the importance of looking out for one another, but it came out both clueless and patronizing, and seemed to encourage a sort of social policing of a quasi-McCarthyist variety by newcomers (one colleague sent me a reply that began with the definition of "paternalism"). It's not that I don't think I should have posted it (the discussion, save for the racism of a few trolls, was more useful than my comments), but that I should've thought more critically about the context. 1. This four-part series on my experience as a juror in a homicide trial (the incident took place in Crown Heights) was one of the harder things I worked on, but sometimes the hard stuff is the stuff worth doing most. 2. One of the few times ILFA actually broke news was this posting, which included images, layout plans, and the investment packagaes for the soon-to-be-completed building at 341 Eastern Parkway. 3. This post in reply to a pair of NYTimes articles about Crown Heights and Franklin Avenue earned some kind words from a few residents who I respect immensely. If they liked it, I must've gotten something right. 4. This post about the brewery-turned-spice-factory on Franklin just south of Montgomery captures some of the fun and innocence of my early days as a blogger, and it's one of the posts that people who've been readers for awhile often remember when we get to talking about the blog through the years (a similar post is this one about Stanley Jones, who used to sit out in front of his storefront on Franklin). 5. This may be cheating, as I didn't actually post either of these pieces here, but these two blog posts for HuffPo New York were in many ways a distillation of many longer posts and fragments that started on ILFA. Insofar as I have anything to contribute to the massive gentrification-industrial-journalism complex, this is a pretty good statement of my thinking. After several thousand words, I think I'm finally done. There are far, far too many people to thank here, and hopefully I'll have a chance to thank them in person in the coming days and weeks, but to the friends, family, and local community leaders, merchants, and residents who've listened, read, talked, argued, laughed, and shared in joys and frustrations with ILFA over the years, I simply can't thank you enough. To the people who've appeared on this blog, thank you for letting me walk into your lives and make a piece of them public. To all the readers, thank you for your comments, your emails, your suggestions, and most of all, for your eyes and your time. It's been grand. My very first post on this site was a silly gentrification joke that relied on a picture of the broken walk signal box on my corner. As I prepared to shut things down, I realized that the signal, which was replaced shortly after I posted that back in 2008, was broken again (see the photo at the beginning of this post). It seemed as good a sign as any that it was time to be done. As an added bonus, I can now tell people that my blog lasted as long as your average NYC walk signal box. Do with that what you will. This will be the last post on this site for the foreseeable future, and after some thought, I don't think I'm going to pass this site down to anyone else, in part because I'm going to keep the Facebook, Twitter, and Instagram pages active to share odds and ends about the neighborhood. Thanks again to everyone. See you on the Avenue.